IBM has released its annual "Commuter Pain Index," which ranks traffic congestion in 20 metropolitan areas around the world. According to IBM, the Commuter Pain Index includes 10 issues: "1) commuting time, 2) time stuck in traffic, agreement that: 3) price of gas is already too high, 4) traffic has gotten worse, 5) start-stop traffic is a problem, 6) driving causes stress, 7) driving causes anger, 8) traffic affects work, 9) traffic so bad driving stopped, and 10) decided not to make trip due to traffic." Each metropolitan area is given a score between 0 and 100, with the highest score indicating the worst traffic congestion (See Table). Favorable Urban Planning Characteristics Associated with Intense Traffic Congestion: The worst traffic congestion was recorded in the developing world metropolitan areas of Beijing, Mexico City, Johannesburg, Moscow, Delhi and Sao Paulo. In many ways, these metropolitan areas exhibit characteristics most admired by current urban planning principles. Automobile ownership and per capita driving is low. Transit carries at least 40% of all travel in each of the metropolitan areas. Yet traffic is intense. This is due to another urban planning "success," objective, high population densities. Higher population densities are inevitably associated with greater traffic congestion (and more intense local air pollution), whether in the United States or internationally. All six of these metropolitan areas scored 75 or above, where a score of 100 would be the worst possible congestion. The next five metropolitan areas have accomplished nearly as much from an urban planning perspective. Milan, Buenos Aires, Madrid, London and Paris all achieve more than 20% transit market shares, and their higher urban densities also lead to greater traffic congestion. Each scores between 35 and 52. Traffic congestion is less in the next group, which includes Toronto, Los Angeles, Berlin, Amsterdam and Montreal. With the exception of Berlin, transit market shares are less, though the urban densities in all are above average US, Canadian and Australian levels. Amsterdam, the smallest metropolitan area among the 20, scores surprisingly poorly, since smaller urban areas are generally associated with lower levels of traffic congestion. The Least Congested Metropolitan Areas: Four metropolitan areas scored under 20, achieving the most favorable traffic congestion ratings. New York scores 19, with its somewhat lower density (the New York urban density is less than that of San Jose). Even lower density Melbourne and Houston score 17, tying for the second best traffic conditions. Stockholm achieves the best traffic congestion score, at 15, despite its comparatively high density. Stockholm is probably aided by its modest size which is similar to that of Orlando (Florida). The Houston Advantage: Perhaps the biggest surprise is Houston's favorable traffic congestion ranking. Houston has the lowest urban density of the 20 metropolitan areas. Houston has the lowest transit market share, by far, at only 1%. Houston also has the highest per capita automobile use among the IBM metropolitan areas. Yet Houston scored better than any metropolitan area on the list except for much smaller Stockholm. As late as 1985, Houston had the worst traffic congestion in the United States, according to the annual rankings of the Texas Transportation Institute. Public officials, perhaps none more than Texas Highway Commission Chair and later Mayor Bob Lanier led efforts to improve Houston's road capacity, despite explosive population growth. Their initiatives paid off. 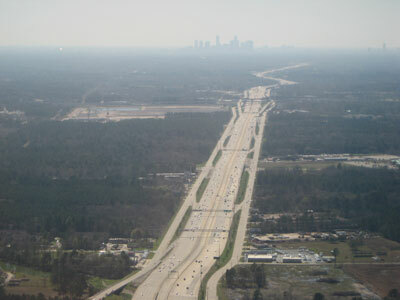 By 1998, Houston had improved to 16th in traffic congestion in the United States. The population growth has been incessant, so much so that Houston has added more new residents since 1985 than live in Stockholm and more than half as many as live in Melbourne. While Houston had slipped to 11th in traffic congestion by 2007, the recent opening of a widened Katy Freeway and other improvements should keep the traffic moving in Houston better than in virtually all of the world's other large metropolitan areas. Submitted by ymouel on Mon, 05/25/2015 - 05:05. You have given more than visitors expectancy. This post is very helpful, edifying and in addition cool thoughts on the topic. Submitted by david watson on Sun, 05/10/2015 - 17:24. Submitted by xijozx1122 on Sun, 05/10/2015 - 08:24. Submitted by david watson on Thu, 05/07/2015 - 16:38. Submitted by abhkr4455 on Tue, 05/05/2015 - 03:15. Submitted by johnz308 on Sat, 05/02/2015 - 13:10. Submitted by xijozx1122 on Sun, 04/26/2015 - 08:17. Submitted by zac1 on Sat, 04/25/2015 - 03:30. Submitted by david watson on Wed, 04/22/2015 - 08:04. Submitted by xijozx1122 on Sat, 04/18/2015 - 03:19.